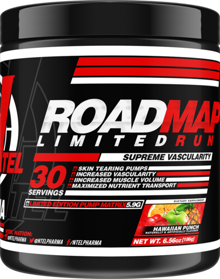 Roadmap OVERFLOW is here bringing the sickest pumps you've ever seen. Have you ever seen the guy in the gym with so many veins popping out of his arms that it looks like a roadmap? That's the effect that NTel has sought to reproduce. With some of the top nitric oxide boosters included at huge doses (a full gram of Nitrosigine! ), Roadmap Overflow is among the best pump formulas in the industry. L-Citrulline Malate - The most popular nitric oxide booster of all time is included in this formula at a whopping 8g dose! Citrulline converts to Arginine in your body better than taking an Arginine supplement. This raises levels of Nitric Oxide leading to pumps, pumps, and more pumps. Nitrosigine - One of the premier pump ingredients on the market today, there is almost double the normal dose of Nitrosigine in Roadmap OVERFLOW as there is found in other pump products. Creatinol-O-Phosphate - Improved endurance and recovery. A structural cousin to Creatine, Creatinol-O-Phosphate actually acts as a lactic acid buffer allowing your muscles to push past their normal limit. Due to the rapid absorption of this compound, effects are acute, showing results very quickly. In addition, this compound improves recovery time.